2-Pack of Burt's Bees Baby Bee Bubble Bath for $9 Shipped! 2-Pack of Burt’s Bees Baby Bee Bubble Bath for $9 Shipped! This stuff smells soooo good! Considering the scent alone, Burt's Bees Baby Bee bubble bath is an indulgent gift for both mom and baby. At this price, it's priced only slightly higher than the regular price of drugstore brands of baby washes! 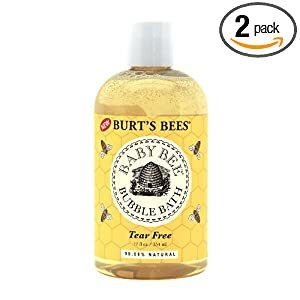 A 2-pack of Burt's Bees Baby Bee bubble bath (12 ounce bottles) is currently priced at $12.94. Sign up for Subscribe & Save and Amazon mom and the price will drop to just $9.06. Shipping is free, too! Burt's Bee's Baby Bee products always make a great addition to any baby gift. Think about picking up a two pack and stashing a single bottle into a couple different shower gifts! Remember, you can cancel the Subscribe & Save option at any time after your order ships! Just go into your Amazon account and look for your Subscribe & Save orders to cancel them.